This rebuttal of the draft proposal for a West Coast sanctuary has been compiled in response to blatant inaccuracies found with this document. The text in blue is provided by us whereas the black text is that of the original document, unabridged. One unimportant map was left out because it did not copy and one photo and one map have been added. The West Coast Working Group, in conjunction with the Royal Forest and Bird Protection Society, is proposing an integrated marine management plan for Auckland’s West Coast. The plan will cover the area from South Kaipara Head to Port Waikato, and will extend into the Manukau Harbour as far as Big Muddy Creek (a line from Laingholm to Mako Point is the proposed cut off). Before preparing formal proposals we would like to ensure that the views of the community and interested parties are canvassed. This special overview and questionnaire is a chance for you to have your say. This special overview and questionnaire is also available online at www.forestandbird.org.nz. www.forest-bird.org.nz/Marine/aucklandwestcoast.asp. The vision for the west coast is a healthy coastal environment. The environment should support all plants, animals, their associated habitats and sustainable recreation activities. The integrated management approach will break down the discontinuity between the land and the sea and will instead view these ecosystems as one, interconnected. By protecting and enhancing the natural values of this coast, human related values will also benefit, creating a ‘win-win’ situation. Truly a noble vision but vague and flawed. This statement envisions recreational fishing, which is sustainable, but it excludes sustainable commercial fishing because this is not a recreational activity. To claim that land and sea ecosystems are interconnected requires justification. Very few creatures live in both domains. How human related values benefit, and what a win-win situation means, must be qualified too. We are interested to know. The most notable discontinuity between land and sea is in the knowledge that landlubbers have (of the land), compared with that of seamen and fishermen (of the sea). The largest problem with the integrated approach is that it is designed to give control over large productive areas in the sea to landlubbers and bureaucrats with little or no knowledge of it. This proposal for instance, uses reasons for having terrestrial parks for closing off large areas in the sea from fishing. It is a Trojan Horse method with misleading arguments. The integrated management plan for Auckland’s West Coast encompasses three Territorial Councils (Rodney District, Waitakere City and Franklin District), and two Regional Councils (Auckland Regional Council and Environment Waikato). Territorial councils cover the area above Mean High Water Springs (MHWS) in conjunction with the Regional Councils. Regional Councils cover the marine area from MHWS out to 12 nautical miles. The proposed marine mammal sanctuary may cover a wider area to include the current habitat of Maui’s dolphin (formerly known as the North Island Hector’s dolphin). The land bordering the Auckland west coast is under a variety of different ownerships. Pockets of this land are protected as Regional Parks, Scientific Reserve and QEII National Trust reserve land. Some of the land is under private ownership such as the forestry lands leased by Carter Holt Harvey. It is important that in any plan for marine management that we also include the surrounding lands, as land management has a significant effect on our marine environment. However, protection to date has in most places ended above the Mean High Water Springs (MHWS). A noble statement and a fresh approach. However, most of the unwanted influence of this marine environment comes from the large Waikato River catchment with its heavy load of sediment, very rich in nutrients from human sewage, overfertilised dairy farms and erosion. The other damaging influence comes from the city of Auckland with its one million inhabitants. Most of their sewage ends up in this part of the sea, after 'treatment', wiping out hardy species such as cockles in the Manukau Harbour and toheroa outside. Sea currents in this area move mainly northward, transporting the overnourished waters along the entire coast. Waves and winds 'mop' these nutrients (now inside organisms) back onto the coast. Thus the bad waters travel along the entire proposed park. Scientists believe that over 80% of our indigenous biodiversity is yet to be found in our oceans. In order to protect the west coast a variety of management techniques are required both above and below MHWS. This will help to create a continuum of protection from land to sea. Scientists are unlikely to find their missing 80% in these waters, since they are degrading while already representing a poor diversity. Our new marine finds come from the (clean) deep sea. Auckland’s west coast marine environment is a very special part of New Zealand. The great diversity in habitats found on this coast are a result of its long geological history. Habitats such as the high coastal cliffs, rocky coastline, iron sand beaches, dunes, and harbours are the product of these past and continual processes. This variance in habitat is the foundation for the area’s equally diverse intertidal and subtidal plants and animals. Completely wrong. This coast is characterised by a vast monotony of sandy flats bordered by sandy beaches (85%) and a small shallow rocky shore (10%) with only little biodiversity. In these waters, already unsuitable for cockles and toheroa, coastal life is eking out a poor sustenance. The coast is dominated by species-poor beaches (85%) of mostly heavy black iron sand. The mudflats and mangroves occupy less than 5% of the coastline. Very few mangrove trees are found here. 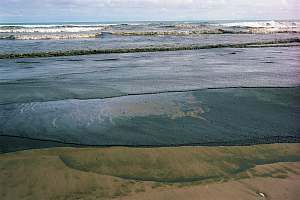 The picture on right shows a typical concentrated plankton bloom near Muriwai, which feels and looks like an oil slick and causes similar harm to burrowed clams and other life. The west coast is a different biological province to Auckland’s East Coast. Waters are typically three degrees colder and nutrient rich, providing nourishment for an array of marine life. Exposed rocky shores are host to such organisms as green-lipped mussels, anemones, whelks and giant bull kelp. Intertidal areas along the iron sand shores and dune environments are the habitat of a great variety of bird life, some of which are endangered, such as the NZ dotterel and the NZ fairy tern. Subtidal areas are home to crayfish, numerous fin fish species and a variety of marine mammals, such as whales and seals and the critically endangered Maui’s dolphin. Vegetation of the west coast is varied from grasses such as spinifex and nationally rare pingao sedge to the large native pohutukawa. The area’s greatly diverse ecology and landscapes are the reason for an increasing number of tourists, both domestic and international, each year. The west coast is popular among the public for its productive, recreational, historical, geological and cultural values. The dramatic rock stacks, rich-black iron sand and high-energy surf provide a great contrast to the region’s East Coast. The proposed Integrated Marine Management Plan for Auckland’s west coast is currently at this stage. This is when we ask stakeholders and the community what they think of each element of the proposal. The formal application for each of the elements has not been made yet so the feedback we receive will help us move to the next stages. The questionnaire at the end of this document is your chance to have a say on the ideas presented in this overview. Once the non-statutory consultation and public feedback has been completed and considered, a formal application for each element will be made. The statutory process may differ slightly for each element of the integrated marine management plan. However, in general the statutory process for all formal applications will involve public notification and an opportunity for public submissions. Marine reserves: the formal application is notified publicly and made available for the public to read and consider. Public have 2 months from the time of notification to make a submission on the formal application. Does this mean that marine reserves won't go through a proposal process once the Park has been accepted? No consultation? Why the hurry? This area has not been changing because of fishing. It has been degrading because of poor water quality originating from far away. Throw the Marine Reserves Act out. It is superfluous, clumsy and costly. Do we really want to saddle our children with this burden? Marine mammal sanctuary: the Minister of Conservation will notify a marine mammal sanctuary application in the Gazette and the public will have 1 month to make submissions. The Marine Mammals Act should be abolished and accommodated in the Fisheries Act. This allows for smoother management of protected areas. Marine Park: a marine park requires new legislation to be established and may be progressed through a different statutory process. An opportunity for public submissions would still be allowed for. No new legislation is required if the whole park and all its closed areas are administered under the Fisheries Act. This smoothly integrates with taiapure and mataitai reserves, and fisheries regulations for Maui's dolphin, already protected under this legislation. Maori fishery management tools and conservation areas: formal applications will be publicly notified and public submissions would be called for. The Minister of Conservation and other relevant Ministers would consider the formal applications and submissions that have been made when making their decision. Each element of the plan will be progressed separately and at different rates depending upon the legislative process and obligations. • The world’s smallest and rarest dolphin is only found off this coast. Maui’s Dolphin has been recognised as a separate subspecies from other Hector’s Dolphin populations in New Zealand. It is believed that this special population off Auckland’s west coast is made up of less than 100 individuals, which means that it is in a critical state. A marine mammal sanctuary would give greater status to Maui’s dolphin and help to further protect it from habitat destruction, pollution and harmful fishing methods. The proposed marine mammal sanctuary may cover an area greater than just the Auckland west coast. With great difficulty and under political pressure has the northern Hectors dolphin been recognised as a separate subspecies. Many geneticists disagree. A marine mammal sanctuary would do no more for Maui's dolphin than the present fisheries restrictions. Please explain what a greater status means to a dolphin. • The accessible rocky intertidal shores of the west coast are extremely vulnerable to human harvesters stripping the rock platforms for food and bait. This may become worse with an increase in population and an enlarged multicultural sector within Auckland. Greater marine protection may help to educate visitors and conserve this marine life. Of the rocky shore, a very small part is accessible for harvesting. Most remains de-facto protected. Why shy away from education? There are other ways to protect a spot. • Opportunities for educational experiences and scientific research will be enhanced with greater marine protection on Auckland’s west coast. Bring in the clear water for education and research. This coast is remote and accessible at only a few spots. If reserves are needed here for education or research, be more specific and be prepared to defend the proposals on their merits, and provide proof of claims made. Why would you expect others to give their birth rights away for something that will not work or for something that is not used? • Endangered bird life such as the New Zealand dotterel and the New Zealand fairy tern can be found in the dune areas of this coast. Migratory waders from international destinations such as Siberia and Alaska also travel to this coast seasonally. A petrel colony exists at Bethells and a series of gannet colonies at Muriwai. Please be specific about how a Marine Park up to MHWS will help the endangered birds? How are these threatened by fishing? This amounts to misleading information. • Visitors to the Auckland west coast are increasing from both domestic and international destinations. Located just 40 minutes from New Zealand’s largest urban area, Auckland, the west coast is easily accessible. Greater marine protection will help to enhance the west coast as a tourist destination whilst ensuring its sustainability. Please explain how tourism to this area is negatively affected by fishing and how greater marine protection will enhance it. • Adjacent land areas to the west coast have been recognised as regional parks and reserves. Greater marine protection will create a continuum from the ‘land to the sea”, creating a more holistic approach to environmental management. Please explain how this works and how fishing affects a holistic approach. The continuum from land to sea has repeatedly been overestimated. Water with mud flows to the sea. Fish fly to the land in birds' stomachs. How does fishing affect this? • The Auckland west coast has rich cultural history. Maori archaeological sites include canoe landing places, pa sites, look outs, burial grounds and spiritual walkways. There are three iwi (Ngati Te Ata, Ngati Whatua and Te Kawerau A Maki) from this coast who have spiritual ties with the ocean and surrounding hinterlands. European culture is also evident along the coast with historical sites including saw mills, cottages and railway tracks. • Geologically the west coat is unique. Maori Bay has well preserved pillow lava formations millions of years old and regionally significant. As a result of past geological processes, the West Coast coastline and foreshore includes a variety of habitats, Such as exposed rocky platforms, high sea cliffs, offshore reefs, boulder beaches, mangrove areas, dune fields, dune lakes and straight iron-sand beaches. Many of these areas are regionally, nationally and internationally significant. Explain how these are threatened and how fishing affects these. The reality is that the coast here consists of a monotounous muddy sand flat bordered by a shallow marine rocky shore, poor in diversity. It is pounded by waves, while the sandy bottom is in continuous upheaval. • The west coast is notorious for a long list of historic shipwrecks. In 1863 the Orpheus was wrecked on the Manukau bar on it’s way through the Manukau Heads. 189 lives were lost making it New Zealand’s worst maritime disaster. It is quite annoying that so many arguments above have nothing to do with the marine environment. All the above reasons can be satisfied simply by . . . doing nothing. Recreation: Surf lifesaving, surfing, fishing, swimming, beach walking, picnicking are just some of the popular recreation activities on the Auckland’s West coast. There are a number of Surf Life Saving Clubs along the beaches from Muriwai Beach in the north to Karioitahi Beach in the South. Intertidal and subtidal marine life: The biota of the west coast is rich and diverse. Intertidal organisms such as green-lipped mussels, paua, anemones and whelks can be found. Crayfish, gurnard, trevally, snapper, whales and dolphins are all present offshore. Fishing: Commercial and recreational fishing are popular on the West coast. Rough seas often make this dangerous and many places inaccessible. Species such as snapper, trevally and gurnard are caught regularly. Right. The inaccessibility of this coast gives it de-facto protection. Snapper, trevally and gurnard are migratory species, not particularly bound to a particular place. They venture in and out of the degraded coastal zone where they are occasionally caught. The recorded recreational catches are but a very small part of the fish stocks over the continental shelf. It can be said that recreational fishing on the west coast does not materially affect the fish stocks there. The fin fish taken for food by the public are all managed under the QMS, which will continue with or without a marine park or marine reserve network. These “protection” measures will not affect the state of those fin fish stocks. Maori culture: There are three iwi along this coast: Ngati Te Ata, Ngati Whatua, and Te Kawerau A Maki. The Maori have many spiritual ties to this coast. Some of the archaeological sites found in the area include canoe landing places, burial sites and spiritual pathways. Great habitat diversity: The Waitakere Ranges has a rocky coastline, exposed on its west to the Tasman Sea. The coastline consists of a variety of exposed offshore reefs, rock platforms and sheltered crevices. This great diversity in habitat within such a small area has resulted in an equally diverse biota. Habitat on this coast also includes two sandy beach intertidal areas on either side of the Waitakere Ranges (South Kaipara Peninsula and the Awhitu Peninsula. Fascinating geology: Geologically the Auckland west coast is phenomenal. Dune barriers, pillow lavas, volcanic necks (such as Lion Rock at Piha), rocky and sandy coastal shores have all been created as a result of geological processes. Many of these landscapes are recognised as regionally, nationally and internationally significant. Historic shipwrecks: The Auckland west coast has a long history of shipwrecks due to its often heavy seas. In particular the heads of the Manukau and Kaipara Harbours are notorious for such disasters. In 1863 the Orpheus was wrecked on its way in to the Manukau Harbour. 189 lives were lost making it New Zealand’s worst maritime disaster. Maui’s dolphin: Maui’s dolphin (formerly known as the North Island Hector’s dolphin) is critically endangered with less than 100 individuals remaining. The greatest number of sightings for the dolphin is along the Awhitu Peninsula and at the Manukau Harbour Heads. Birdlife: The South Kaipara Head is an extremely important breeding, roosting and feeding ground for a variety of birds. Threatened species endemic to New Zealand, such as the NZ dotterel and the NZ fairy tern use the dune area to nest and the foreshore to feed. This area is also important internationally as a ‘stopover’ for migratory birds coming from as a far afield as Alaska and Siberia. Birdlife is also significant on the sandspit at the mouth of the Waikato River where NZ dotterels are also reportedly breeding. Outstanding productive habitat: Big Muddy Creek inside the Manukau Harbour has an outstanding representative growth of mangrove forest. The intertidal mudflats associated with the mangroves are rich in intertidal organisms. Mangroves are indeed doing well in all the mud from soil degradation. Rare and endangered plants: Whatipu Sands Scientific Reserve has some of the last naturally growing Pingao sedge plants. These rare native sandbinding plants help to prevent sand from eroding. Native pingao is not rare but it is threatened by harmful dune plantings by dune huggers. It needs open rolling dunes to thrive. The attentive reader will by now have noticed that an organisation like Forest and Bird can find no valid arguments for their proposal. They are not aware of the very poor quality of the coastal water here, or they deliberately wish to keep readers in the dark about this. Like generals without armies, they draw lines on maps and move their pieces. Can we really be serious about their proposal? Commercial and recreational fishing methods using set nets and commercial trawling: This is of particular threat to Maui’s dolphin. The dolphin has lungs similar to humans and so when caught in a set net may drown if unable to break free. Given the critical state of this dolphin’s population (less than 100), fishing related threats need to be reduced to zero to ensure its survival. Six dolphins died in 2001-2002 due to set nets. This threat has been adequately dealt with using fisheries regulation. A marine park won't do better. If set nets are bad, ban them. It is as simple as that. If a population cannot survive a few unnatural deaths, there must be something else wrong - pollution comes to mind. Over fishing in our subtidal areas: The mixture of commercial fishing quotas and recreational fishing catches means that a great variety and number of fish species are being taken from the west coast every year. Increases in Auckland’s population will mean an increase in recreational fishers. The extinction of any species from our marine environment may have further repercussions throughout the entire ecosystem. Marine populations have for thousands of years done well with human exploitation. Furthermore, the West Coast is naturally protected by high waves. It is not readily accessible over large parts of its rocky shore. Its beaches are extensive. Recreational fish catches here are a negligible part of the total. Extinction in the ocean has not been observed for any water-breathing marine species yet, worldwide. In NZ there exists no indication either. Pollution: The main source of pollution is from poor land management in surrounding lands. Pollution can affect water quality and eventually accumulate enough to destroy some habitats and species. There is growing evidence to suggest that dioxins may affect fertility in Maui’s dolphin. These dolphins are at a greater risk to pollution due to their preference for shallow waters. Pollution sources may include sediment run -off, litter on beaches, fertiliser runoff, sewage disposal, etc. The main threat is pollution arriving from farmland far away in the Waikato and further. Carried by currents, pollution arrives from as far away as New Plymouth. Pollution also arrives in large volumes from Auckland's sewage plants. Very little pollution arrives from the sandy dunes along this stretch of ocean. So what does F&B suggest we do about this, the real problem? What about a truly integrated approach and begin saving the land? Why does F&B believe that this is not the main reason for stress in Maui's dolphin? Compared to the observable stresses from pollution, dioxins are far-fetched and unproven. Visitor impacts: These may be numerous and key elements of each of the other threats mentioned here. Increases in people fishing, walking on rock platforms and leaving litter on beaches are just a few of the potential threats if visitor numbers are not carefully monitored and managed. Would education not be a better tool? But where is the proof? What specific monitoring and management tools are envisaged? Intertidal over-harvesting: Shellfish over-harvesting is an increasing problem on many of the intertidal rock platforms on west coast beaches. As the Auckland population grows and becomes more multicultural, an increasing number and variety of organisms are being stripped from our rock platforms. This may have significant effects throughout the entire marine food chain. Yes, this is a real issue. However, we would emphasise that the management to date of the intertidal zone can only be described as pathetic. The regulatory framework and the enforcement of same are simply not working. Something needs to be done and done decisevily. There has to be a better way – marine reserves are certainly not the answer but some simple tools when well publiscised well, can work. By all means, close off areas of the shoreline to harvesting. Obviously we need to be able to close areas for whatever time is required for the recovery of species. However, it is fair to say that the exploited areas are a small part of the whole, which is protected by poor access. There is no evidence that by stripping the intertidal area, the effect ripples down to the subtidal areas, let alone to the entire food chain. There exists no ecological evidence either. Uncontrolled domestic animals: Domestic animals such as cats and dogs that are allowed to roam free may pose a threat to wildlife. Animals such as Little Blue Penguins found on the west coast are often harmed by domestic animals. When are the local territorial authorities going to start enforcing their bylaws? Marine reserves won't help. Marine invaders: Marine pests are a significant threat to native wildlife. Pests compete with the natural wildlife for habitat and food, eventually taking over and eliminating natural species. Currently there are just four definite intertidal marine invaders on Auckland’s west coast. This is in contrast to some 66 found on the East Coast. This great difference in numbers is due to the many cargo ships and tourists on leisure boats, which frequent the East Coast. For this reason, among others it is extremely important that we ensure the west coast remains invader free. We would like to know how a marine park or a marine reserve is going to prevent infestation from marine pests. The main reason is not that fewer ships visit this area but that the 60 pests on the other side choose not to live here due to degraded conditions. What have these 60 pests done to the marine environment? What is their significant threat to native wildlife? Land pests: Introduced pests such as stoats and wild ginger can cause harm to native wildlife. Greater biosecurity practices may help to prevent such pests from establishing on the west coast. The situation in the sea is entirely different from that on islands where introduced pests are profoundly damaging. How are protected areas going to help? What kind of biosecurity practices will be effective? Have any worked so far? Off-road vehicles: Off-road vehicles can pose significant threats to our wildlife. Sensitive areas above mean high water springs such as Papakanui Spit, where endangered native birdlife is found, should be off limits to such vehicles. Both Muriwai and Karioitahi beaches see considerable beach traffic and any movement of these vehicles into dune areas is of concern. If there is a problem, put up a sign. Make Papakanui Spit a bird sanctuary. Fishermen will give it their blessing. But first prove the irreversible damage caused by vehicles. A Marine Park to MHWS will have no impact on this area. Areas that may warrant greater protection as marine reserves, rahui, maitaitai and/or taiapure areas. The areas outlined above have been chosen for their biological values, their ability to represent the range of natural habitats occuring on the Auckland West Coast and their ability to provide educational opportunities. 1 Waionui Inlet and Papakanui Spit: The Inlet is an important feeding area for a variety of birdlife. It is also important as a breeding area for adult fish and a safe haven for juvenile fish. The inlet is extremely productive and adds to the total productivity of the Kaipara Harbour, which is a popular fishing spot. Papakanui Spit (stewardship area) forms the western boundary of Waionui Inlet and is a vitally important breeding and roosting site. Make it a bird sanctuary. Why has this not been done already if it is so important? You have fishermen's blessing and support. 2 Oaia Island and Muriwai Beach: Oaia Island is situated approximately 1.5km off Muriwai Beach. It is a haul out site for the New Zealand fur seal with numbers increasing annually. The island is also home to a series of Australasian Gannet colonies, one of 3 sites within the area. Muriwai beach is a representative stretch of exposed sandy coastline supporting a typical range of bivalves, which live deep below the sand at extreme low water springs. A small part of Muriwai beach (southern end) is a Telecom cable area where fishing and anchoring is prohibited. Offshore from Oaia Island and Muriwai Beach there are a great variety of fish species such as gurnard, trevally, and snapper. Whales, dolphins and other marine mammals are also found off this coast. The wildlife shows that fishing by them and people can go together, but don't be surprised when a burgeoning seal population depopulates the area. Are they breeding there and if not, why not? Make the Telecom cable area a marine reserve, but don't expect it to work. Show it on the map. You have fishermen's support. Where the sea becomes clearer, outside the management area, there is indeed an abundance of fish. Unfortunately, the recreational fisher cannot get there. The bivalves are a more sorry story, since toheroa, once abundant here, went in decline and had to be protected from harvesting, using fisheries regulation in the late 1970s. It is not expected to be available for widespread harvesting in the foreseeable future with stocks teetering at 2% of what once was. Polluted water is their enemy. What difference would a marine reserve make? 3 Maori Bay Coast: Day visits to this part of the Waitakere coastline are popular. Attractions include the gannet colonies, fishing, pillow lava formations, intertidal life and surfing. The area is very accessible and camps and surf lifesaving clubs are close by for educational groups to base themselves. 4 Te Waharoa Coast: This area is characterised by habitats, including rocky shores, offshore reefs and gravel and sand beaches. The great variety in habitats has created an equally diverse intertidal life - the most diverse along the entire Waitakere coastline. 5 Anawhata Coast: Habitats within this area include sandy beach, rocky shores and boulder beaches. Seaweed and sponges are particularly diverse, along with a variety of other intertidal life. The area has not yet been spoilt by subdivision and hence has an aesthetically pleasing landscape. 6 Piha Coast: This is the most popular beach on the Auckland west coast and is very accessible. Consequently, much of the intertidal life has been stripped. Locals have a voluntary ban in place on the taking of shellfish. This would be given legal strength if it were to be made into a marine reserve. There are also a number of camps and surf clubs within this area, making it an excellent base for educational groups. If legal strength is needed, the Fisheries Act would be the better agent. Let locals get their act together and manage the stocks. If a voluntary ban works, why make it more complicated? If it doesn't work, why would regulation help? 7 Destruction Gully Coast: Habitat within this area consists mostly of hard volcanic rocky shores and boulder beaches. Nineteen intertidal species are found only in this area. Colourful sea slugs can be found here as well as a diverse range of subtidal animals. Are these species in any way affected by fishing? The fact that such species are found only here is because hard rock is rare along the West Coast. Most rock is too soft to secure sessile organisms long enough to grow old. Where hard rock is found, long-lived species can be expected, complete with the life depending on it like colourful seaslugs. This area is just too smal to be of any ecological importance. It shows how species-poor the rest of the area is. 8 Lawry Point Coast and Big Muddy Creek: Habitat in this area consists of intertidal mudflats, sandstone reefs, stable cobbles and mangrove forest. Colourful sea slugs, shelly tube worms and a rich assemblage of sea squirts can be found here. The educational camp at nearby Armour Bay could make an excellent base for studies. This area is favourably affected by rapid tidal currents which cleanse the substrate and organisms infested with mud. Its only threat is from the rich sewage effluent and dense plankton blooms. This in turn is beneficial for a variety of opportunistic organisms like seasquirts, often indicators of degradation. The area is not under any form of threat, and if it were needed for education, this would have been done a long time ago. The fact that it is not being used as such, probably means that it is not an excellent base for studies. 9 Port Waikato estuary: Located at the mouth of the Waikato River, the Port Waikato estuary is an important feeding and breeding area for New Zealand wildlife. The Waikato River is the longest river in New Zealand and is the habitat for a variety of native freshwater fish such as yellow-eyed mullet, black flounder, and longfinned eels as well as saltwater fish such as Kahawai. Most of New Zealand’s native freshwater fish are migratory and need access to the sea or an estuary during their lifecycle. This is one important reason for the protection of this estuary. The estuary is also an important feeding area for a number of wading birds. Nearby at the mouth of the river is a sand island, which is prime breeding habitat for regionally important bird species such as the Caspian Tern and NZ Dotterel. Man and Beast have been doing well together in this area. Leave it alone. What benefit could a reserve possibly have for migrating species such as mentioned above. For fish the Waikato River is only as long as it takes to reach the first dam. If the birds need protecting, then create bird sanctuaries, but provide proof first. New Zealanders have the right to see such proof before surrendering their birth rights. Note: Ngati Whatua have stated that they would like to see ‘Hot Spots’ 1&3 protected by taiapure. The integrated marine management plan for Auckland’s West coast is made up of 5 main elements (A - E on following pages), including a marine park, marine mammal sanctuary, marine reserve network, Maori fishery management tools and shoreline and hinterland conservation areas. A. Marine Park: The integrated concept for the west coast is to establish a marine park with a number of different zones within it. The establishment of a marine park will require special legislation. This may be a timely process and hence other elements making up the park such as a marine reserve network and a marine mammal sanctuary may be progressed separately. Legislation already exists to develop these latter elements. Examples of Marine Parks in New Zealand include the Hauraki Gulf Marine Park and the Sugar Loaf Islands Marine Park. International examples include the Greater Barrier Reef Marine Park, Australia and Solitary Islands Marine Park, Australia. All this can be done under the Fisheries Act. No extra legislation is needed. Every option a marine park wishes to have is already provided for within the Fisheries Act. The accompanying Discussion Document reveals the plan to have all commercial fishing banned from Marine Parks by a change to the Fishing Act. This change will at the same time ban all commercial fishing in the Hauraki Gulf Marine Park. Beware of the Trojan Horse! Why a Marine Park? The West Coast Working Group along with many local residents and community members believe that a Marine Park is needed on the Auckland West coast to better coordinate the management of the marine environment and foreshore. The objective of the marine park would be to protect representative examples of marine bio-diversity, while catering for a range of recreational activities. A Marine Park would establish an advisory/management board made up of a number of representatives from stakeholder and community groups. The responsibilities of this board would include advocacy, education and the co-ordination of management objectives within the marine park area. A marine park advisory board may achieve greater marine management by working alongside local bodies and statutory authorities. In theory the Marine Park may be thought of as a legislative ‘tool box’ in which all other legislation is used and monitored. The word believe is indeed well chosen, since nothing in this proposal is based on good knowledge. The marine park would do absolutely nothing to marine biodiversity, which is about sustainable populations of all species, and these are not threatened by current fishing practices. Local management is indeed needed where areas become protected, but with the maintenance budget that goes with it. This is not possible under the MRA. The proposed management board consists of bureacrats rather than the locals. A marine park is not needed for all this. Fishermen are most interested to know what the final outcome is going to be. Here the word may is used. What does that mean in practice? Not mentioned here, the accompanying Discussion Document wants to modify the Fisheries Act to ban all commercial fishing inside a Marine Park. Since the Continental Shelf boundary runs from 8nm out in the north to 14nm in the south, the proposal implies a total commercial fishery exclusion over the width of the continental shelf. Option 2b takes 400x22= 8800km2 or 880,000ha out of fishing, without any suggestion of compensation or how much this will cost New Zealanders. This is 5% of NZ's territorial sea! Compare this with 5km2 for Goat Island and 7480km2 for the Kermadec Islands. How can the people who work with the sea on a day to day basis have any confidence in rules made by people who do not? Think about it. Think about its social effects. All sacrifice for no benefits in return. B. Marine Mammal Sanctuary: The Department of Conservation administers the Marine Mammals Protection Act 1978, which provides for the conservation, protection and management of marine mammals. This Act allows for the establishment of marine mammal sanctuaries. Activities can be controlled by specifying what can and cannot be undertaken within the sanctuary and by imposing restrictions. Examples of marine mammal sanctuaries within New Zealand include the Banks Peninsula marine mammal sanctuary (to protect Hector’s dolphin) and the Auckland Island’s marine mammal sanctuary (to protect New Zealand sea lion and southern right whale). The Marine Mammals Protection Act is one of this country's big mistakes, since all it does is already provided for in the Fiseries Act. It is an unnecessary and costly duplication that should be done away with. Maui's dolphin is now protected under the Fisheries Act, not under the MMPA. Why a Marine Mammal Sanctuary? The world’s smallest and rarest marine dolphin is only found off this coast. Maui’s dolphin has been recognised as a separate subspecies from other Hector’s dolphin populations in New Zealand. This special population off Auckland’s west coast is made up of less than 100 individuals, which means that it is in a critical state. A marine mammal sanctuary would give greater status to Maui’s dolphin and help to further protect it from habitat destruction, pollution and harmful fishing methods. Increasingly, New Zealand fur seals are also being seen off this coast. Fur seals would also benefit from greater protection on this coast. Under political and ideological pressure to give it higher conservation status, the Maui's dolphin has been recognised as a separate subspecies. The scientific argument is based on only very few Maui's dolphins in the samples used. The same data suggests that the East and West Coasts of the South Island also consist of two different subspecies. A population of 100 is indeed in a critical state, but the reasons for this have never been adequately presented. In the end, we must accept that extinction is a natural selection process, however sad. But the point is that all the protection it can be given, has already been provided for. A sanctuary is not needed and would not achieve more. What would greater status mean to a dolphin? As far as the fur seals go, we must expect them to multiply in time, also threatening Maui's dolphin by competing for their food. Who would like to protect that? You need to read and understand the genetic work. In its mt-DNA, the NI population is more different to either of the South Island east and west coast populations than the latter two are from each other. Further, the NI ones are noticeably bigger (about 10% in adults). These changes are not trivial. You say that the analysis is based on just a few samples. Well, that's not surprising, there are just a few of these dolphins left. To my knowledge there was no political drive behind the analysis. To say that there was is an unfair slur on the folks doing the work. You try to be pedantic about knowing when a subspecies is a subspecies and when it is not. In biology, this is still a contentious area, but I have explained your point in the Hector's Dolphin article, and warned readers here of the amount of contention and arbitrariness and the small sample size, which you agree with. You say that the differences are not trivial - a matter of opininon. In any case they are irrelevant to the survival of the species. • Recreational line fishing and drag netting (primarily for mullet and flounder at Muriwai and Karioitahi beaches) within the general amateur fishing regulations or specific local restrictions as may apply. Marine reserves may be set up under the Marine Reserves Act 1971 and are administered by the Department of Conservation. Marine reserves protect areas of the sea, seabed and foreshore in a natural state for the purpose of scientific study. Marine habitats, plants and animals are all protected within marine reserves. These areas are usually completely ‘no-take’. Examples of marine reserves in New Zealand include Cape Rodney–Okakari Point Marine Reserve (also known as Goat Island), Long Bay–Okura Marine Reserve and Kermadec Islands Marine Reserve. Why a Marine Reserve Network? The intertidal organisms of many of the more accessible places on the Auckland west coast have been, and continue to be over-harvested. Subtidally, fish are taken by recreational and commercial fishing. Scientists believe that 80% of New Zealand’s bio-diversity remains undiscovered in our oceans. For these reasons it is important that we create ‘safe havens’ or ‘refuges’ for our marine life. Studies from around the world of 100 no-take marine reserves have shown an average increase of 91% in the number of fish, 31% increase in the size of fish and 23% increase in the number of species within reserves. Spillover of fish may occur into the surrounding waters of marine reserves. Having a network of ‘no-take areas on the Auckland west coast will ensure that a representative collection of marine bio-diversity is protected on this coast and will add to the protection of New Zealand’s bio-diversity as a whole. They also allow for scientific research to be undertaken in the marine environment. Currently there are no marine reserves on the Auckland west coast. This paragraph gives a large amount of misleading information. It is unbelievable how gullible the marine reserves lobby is. Let's count them for fun: 1) Whereas the more accessible places are overharvested, the much larger parts of the intertidal rocky shore remain de-facto protected. 2) You cannot take fish above the high tide. 3) Scientists will NOT find new species in this degraded area. Almost all new discoveries come from the clean deep sea. 4) These studies have mostly been done on heavily overharvested tropical coral reefs, which bear little or no relevance to the NZ situation. The benefits claimed are not impressive, and not worth sacrificing so much for. 5) The best spillover that can be expected is no more than 10% of the lost fishery. It can be expected only for resident fish, which are rare on this coast, and are not typically fished. 6) The network idea lives only in people's minds. It has never been substantiated. 7) Networks of marine reserves bring large areas under control of people who have no knowledge or experience of the sea. It is an undesirable situation. 8) Scientific research can and should be done anywhere, and should not depend on or wait for the presence of a marine reserve. 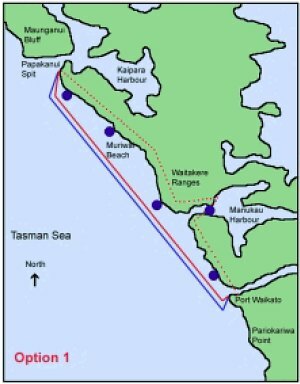 9) The Telecom cable area is a de-facto marine reserve, but scientists have never looked there. • Anchoring There is a fine of $5000 for uprooting a marine plant in the proposed Bill. What you cannot do in a Marine Reserve: Generally, activities that damage or disturb the habitat and marine species are not allowed within Marine reserves. Commercial fishing is not allowed and usually recreational fishing and seafood gathering is not allowed either. NB: The Marine Reserves Act is currently being revised by Parliament. What a waste of time - it should be abolished. Taiapure: A taiapure is an estuarine or littoral coastal area, which is traditionally important to iwi or hapu. A taiapure protects these local areas and recognises that local communities have special needs relating to them. Anyone may apply for a taiapure. The proposal must show that the area is important to the local iwi or hapu for kaimoana (seafood), or spiritual or cultural reasons. The Minister of Fisheries receives taiapure applications and makes his/her decision in consultation with the Minister of Maori Affairs. A special tribunal of the Maori land court hears any submissions or objections. If the Ministers declare that the area should become a taiapure, the Minister of Fisheries forms a management committee of people nominated by and representative of the local Maori community. The committee recommends regulations to the Minister of Fisheries to manage the area. The Ministry works with the committee to administer these regulations. Commercial and/or recreational fishing may be allowed in a taiapure however, rahui may be applied to stop all or some fishing to allow restoration of these coastal fisheries or because the area is sacred to iwi or hapu. Maitaitai: A maitaitai reserve is an area of traditional importance to Maori where the tangata whenua are authorised by the Ministry of Fisheries to manage and control the harvest of seafood for non-commercial purposes. Kaitiaki appointed by the local Maori community can manage this area by passing bylaws. Bylaws may include species that can be taken, quantity of each species, size limits, methods of catch, area where taken and any other specifications made by the kaitiaki necessary for the sustainable management of fisheries resources. Controls on non-commercial fishing must apply equally to all people with only one exception. If a reserve is closed for general harvesting, the kaitiaki may approve the taking of seafood to meet the needs of the marae belonging to tangata whenua of the reserve only. Rahui: Rahui is a ban on all or some fishing to allow restoration of coastal fisheries or because the area is sacred to iwi or hapu. Rahui may be applied to selected species and may only be initiated by tangata whenua. Rahui may be applied within a taiapure or maitaitai reserve. The statutory support for a rahui comes from the Fisheries Amendment Act 1998, and is part of the Fisheries Act 1996 (the principal Act), section 186a. This amended section allows for temporary closures of fishing areas or restrictions on fishing methods (maximum of two years after notification in the Gazette). Section 297 and 298 under Part 16 of the Fisheries Act 1996 allows for regulatory closures, which are open ended. Currently the longterm rahui at Karekare beach on Auckland’s west coast is supported by a regulatory closure. Every local community should have the right to call for and manage a local area. The racial clauses in all acts should be abolished. We are one people, in one country, having but one future. More importantly, the above arguments once again demonstrate that the Fisheries Act is the more flexible agent for creating, managing and policing protected areas, both in the territorial seas and the Exlusive Economic Zone. The surrounding shoreline and hinterland areas of the West coast require protection as well as the marine area below MHWS if we are to achieve a holistic ‘land to sea’ approach to environmental management. Through the integrated management plan for the Auckland west coast private landowners will be invited to consider including part of their land as private conservation areas. Liaison with local and regional authorities to further protect public land will also be undertaken. Conservation areas may be established under the QEII National Trust or other covenant. Local and regional authorities may apply for reserve status for lands also under the Reserves Act 1977. For example the Whatipu sands area has recently been made into a scientific reserve by the Department of Conservation and will be administered by the Auckland Regional Council. Each boundary option is made up of exactly the same elements as outlined in points A - E of the Integrated Management Plan. The only difference between the two models is the size of the marine park and the size of the marine mammal sanctuary. The West Coast Working Group and Forest and Bird are seeking your comments on the entire concept of the integrated plan with each of the elements and also your preference for the different boundaries of the marine park and marine mammal sanctuary. See maps above. • Marine Park from Papakanui Spit in the North to Port Waikato in the South. Extends into the Manukau Harbour to a line drawn from Laingholm to Mako Point. Extends from Mean High Water Springs (MHWS) to 4nm seaward. 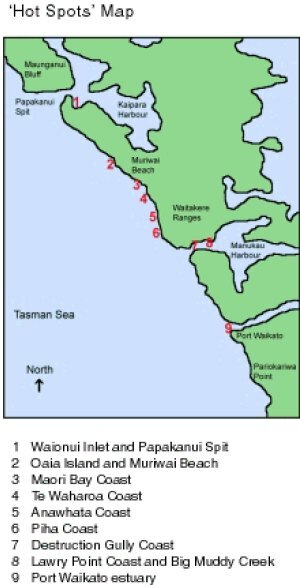 • Marine Mammal Sanctuary from Papakanui Spit in the North to Port Waikato in the South. Extends from MHWS to 4nm seaward. Extension into Manukau Harbour the same as the Marine Park boundary. • Marine Park from Papakanui Spit in the North to Port Waikato in the South. Extends into the Manukau Harbour to a line drawn from Laingholm to Mako Point. Extends from Mean High Water Springs (MHWS) to 12nm seaward. • Marine Mammal Sanctuary from Maunganui Bluff in the North to Pariokariwa Point. Extends from MHWS to 4nm seaward. Extension into Manukau Harbour the same as the Marine Park boundary. This entire area covers the current Ministry of Fisheries commercial set net ban area). 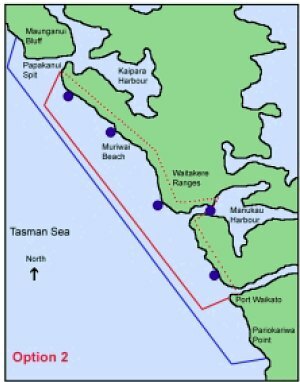 • Marine Mammal Sanctuary from Maunganui Bluff in the North to Pariokariwa Point. Extends from MHWS to 12nm seaward. Extension into Manukau Harbour the same as the Marine Park boundary. This is one of the most misleading parts of this proposal. Can you read the 'NB maps not to scale' remark in the graph legends above? Well, these maps do indeed not truly represent the plan. Deliberate deception comes to mind. For instance, Maunganui Bluff lies 40 nautical miles off the map to the north while Pariokariwa Point lies 80 nm off the map going south. We have provided a map in the righthand margin which more truly reflects the situation. For comparison, the Goat Island marine reserve (5.2km2) has been shown to scale in brown. Also left out was the large de-facto marine reserve, the no-anchoring, no-fishing cable zone, shown on our map in orange. It extends from the shore to the territorial limit, 12nm out in sea, covering an area of nearly 100 square nautical miles (over 320km2) or twice the total area already in coastal marine reserves. After having read this rebuttal, would you have any confidence left in what Forest and Bird say, or the Department of Conservation for that matter? Would you have any confidence in them managing these areas?